Use Atelier Waterproof Drawing Ink to achieve intense black lines and shapes through to mid-tone greys and delicate pale grey washes. It is water soluble and can be used straight out of the bottle or diluted with water. 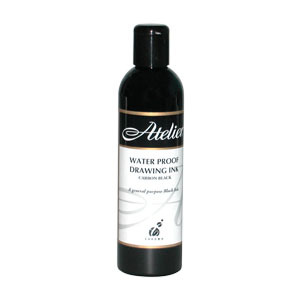 Atelier Waterproof Drawing Ink is ideal for brush and pen work. Suitable for paper, card and other porous surfaces.